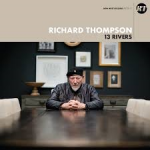 Share the post "Album review: RICHARD THOMPSON – 13 Rivers"
Richard Thompson describes this album as “There are 13 songs on the record, and each one is like a river. Some flow faster than others. Some follow a slow and winding current. They all culminate on this one body of work.” It also marks his first self-produced album in over a decade and he is joined by his regular accompanists Michael Jerome (drums, percussion), Taras Prodaniuk (bass) and Bobby Eichron (guitar). It is indeed an album of varying moods and pace, you have the rock ‘n’ roll of ‘Bones of Gilead’ sitting with ‘The Rattle Within’, which features an amazing piece of drumming from Michael Jerome. The start of the album has the more experimental songs, before you are into more familiar sounding Thompson songs. ‘O, Cinderella’ has a hint of his folk roots, with a memorable chorus and it contains the great lines ‘I want to make cupcakes with you’ and ‘I want to dust cobwebs with you’. More serious lyrical subjects are tackled on ‘Shaking The Gates’, another song that features a female backing vocalist whose harmonies fit perfectly with Thompson’s singing. Richard Thompson is a superlative guitar player, be it the laid back guitar on ‘The Dog In You’ or the brooding, dark menace in his playing on ‘The Storm Won’t Come’. His playing transcends musical genres as his talent can be appreciated by all lovers of good music. This entry was posted in ALBUM REVIEWS, ALBUM REVIEWS (Mobile), All Posts and tagged 13 Rivers, album, blues, Fairport Convention, folk, guitarist, review, Richard Thompson, rock, singer songwriter. Bookmark the permalink.